One of my favorite things to do is play Rocksmith on my Xbox One in my home theater. I think I’ve put over 500 hours into the game over the past couple years. 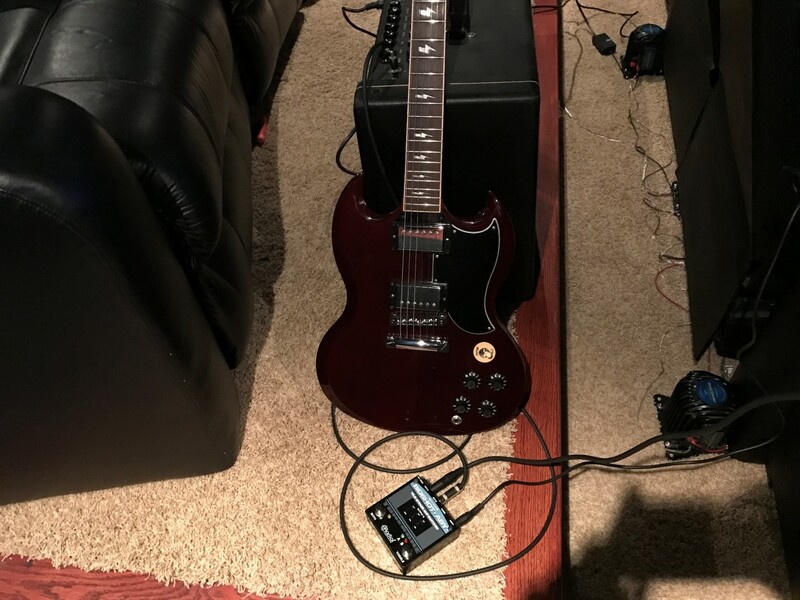 Once you’ve played quite a while, you start to realize that eventually in order to hear all of your mistakes you need to start hearing yourself playing through a real amplifier and not through the game, which masks a lot of your imperfections. You need an amp with Rocksmith. When I started looking into this, I saw that there were a lot of suggestions scattered throughout different forums saying how to do it. One of the first suggestions was using a Y-cable. I had one of these at home so I tried that first. Unfortunately, it was a dismal failure because the one I had was a stereo splitter instead of a mono splitter. I think even a mono splitter would have likely failed as well based upon what I read due to grounding issues. So what did I learn? Well right away I learned that some of my technique is pretty bad, lol. Notes that count as ‘correct’ on Rocksmith and may blend in with the rest of the song kind of stick out like a sore thumb when you’re listening to it on a real amp. In general though I really liked the change, in fact I wish I would have spent the money earlier to do it sooner. When doing it, I would recommend going into the game and turning down the guitar volume to 0 so you can only hear your guitar through the amp and not through the game as well. That way any sound you play will immediately come from the amp and won’t be delayed through the game. Depending on your TV lag, you may also experience some audio/visual issues since the audio from the amp is immediate but the TV sound may be delayed from 10 to 100ms. I didn’t notice much of an issue with that after I switched my equipment to game mode. This is how I had it hooked up below. Basically the guitar goes to input, the Rocksmith cable from the Xbox goes to A, and the amp goes to B. There are other devices that might work in this scenario, but a lot of them are kind of pieces of junk according to reviews. That’s why I decided to spend the extra money to do it. 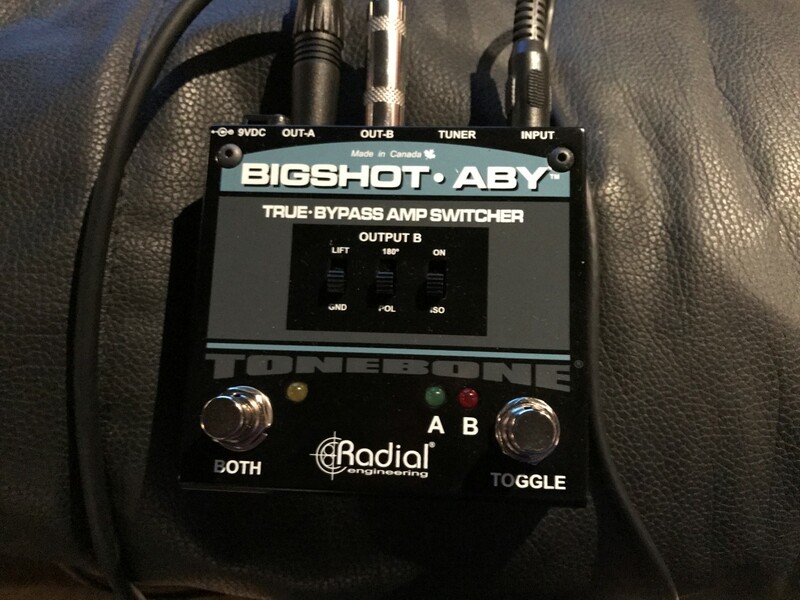 The 4 1/2 stars the Radial BigShot switcher has at the time of this writing are well earned, it doesn’t have any of the grounding issues or other problems I’ve read about from people trying to go with lower quality items. I’ll probably be putting out some more Rocksmith 2014 related articles in the future. If there’s something in particular you want to know, please send me an email and I’ll try and address it in the next Rocksmith post. Next articleSuper Chexx Pro Bubble Hockey released!